As the flag carrier airline of the Netherlands, the vision of KLM’s marketing program is to humanize advertising through personalization and relevance at scale. Supported by a data-driven approach, KLM wanted to address the proliferation of fragmented channels and develop smarter, more effective media buying models. By combining data to connect every touchpoint of the customer journey, their aim was to serve more relevant advertising and improve media spend. KLM partnered with Relay42, whose data management (DMP) capabilities empower marketers to achieve data-driven personalization at scale. 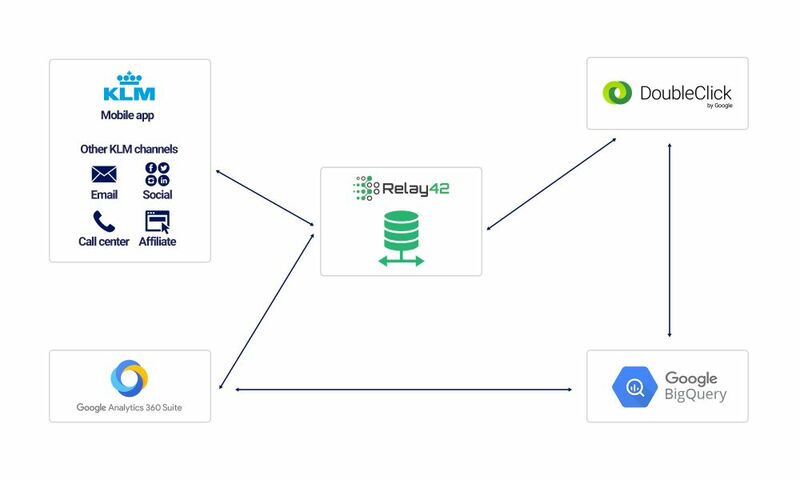 The Relay42 platform works by stitching together all touchpoints and data sources (including all Google solutions), orchestrating customer journeys in real-time and then activating the unified data to drive business and user experience results. Fig. 1: By collating and enriching data sources and touchpoints, the Relay42 DMP serves as KLM’s customer journey orchestration engine. This approach helps KLM meet its objective of humanizing advertising through agile and connected data. Relay42 and KLM created a data flow setup with the Relay42 platform at the core. Thanks to Relay42’s tag management system (TMS), all customer interactions on KLM’s website and app, as well as relevant indicators from other channels and data sources such as email, social, CRM, call center and affiliates can be tracked and synced in Google Analytics 360. Data gathered via Relay42’s own tags and DoubleClick Floodlight tags can also be sent from Relay42 to the DoubleClick platform so that relevant ads can be targeted to appropriate audiences. In order to perform deep-dive analyses, KLM simply exports raw-level data (from DoubleClick using Data Transfer and from Google Analytics 360 through seamless integration) to BigQuery. BigQuery can then correlate site behavior with ad impressions, which enables Relay42 to activate the data and inform the build of predictive models. KLM developed a real-time buying setup to include predictive modeling. In this setup, website and app interactions are tracked in the platform thanks to the Relay42 tag management system. Relevant consumer behavior can be streamed in real time to a prediction engine developed by KLM in the Google Cloud Platform, with the outputs then streamed straight back to the Relay42 platform. From here, Relay42 can activate rule-based segments based on the prediction outcome. And by syncing this with DoubleClick, ads can be served and targeted to maximize relevance. In the test, KLM linked the Relay42 customer interaction data to their predictive model to predict how relevant their ads would be. The setup enabled a decision to be made in real time whether or not to serve a specific ad to a user. Through the A/B tests it became clear that the new model, in fact, did generate a significant uplift in bookings. With the cost per booking 40% lower during the test period, KLM was able to achieve more than twice as many bookings at the same spend. Looking for some inspiration on the eternal quest to maximize your load factor? Here's how airlines are using Intelligent Journey Orchestration technology to fill more planes.